This was a post I did a year or so again! But I have been working on all the fun details in my closet (Which I will post SOON) In the meantime I thought this would be fun to post again! Phew. . . I have been working on my Master Closet in what seems like FOREVER! I am so HAPPY to finally have it done!!! YAY!!! Here are all the fun BEFORE and AFTER pictures! For those of you that are interested in the paper I used… you will find it HERE! Wallpaper Warehouse has the best prices around! Their customer service is also AMAZING. I had to exchange one of my wallpaper rolls. I was beyond impressed how they took care of me and my slight hiccup! Here is more info about their their GREAT company! I found it very interesting! Ok…on to the FUN STUFF!! I walked straight into a LONG double bar of clothing! And even less appealing was the top of my shelf! It ended up becoming a place for all my random shoes and misc items! 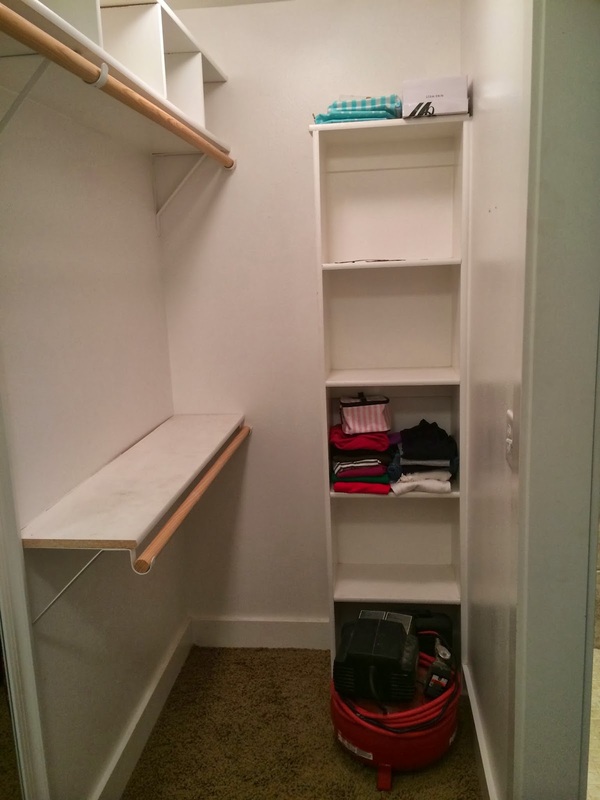 As I gave my closet a bit more thought, I came up with the idea of opening up the middle and adding a full-length mirror to the center of the closet. So instead of walking into a dead end of clothing, it opened up the space! It made the room feel Sooo much BIGGER!! On top of my side shelves was a lot of wasted space, so I had Brett add a few more boxes that extended to the ceiling. Notice in the AFTER pictures! After much prep work the wallpaper began! 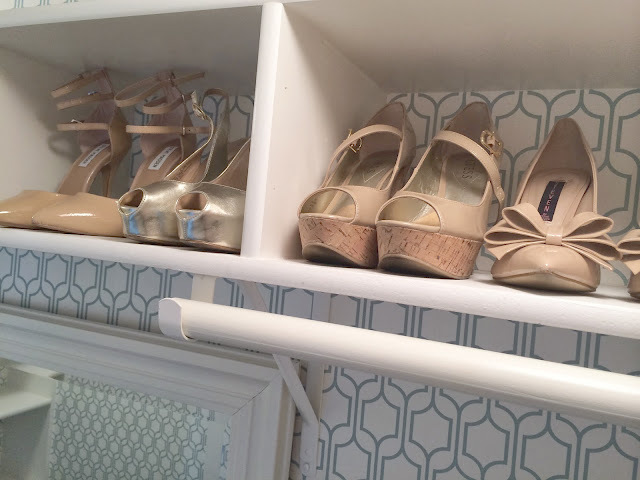 Here is a Sneak Peak of the closet all arranged, shoes in, clothes hung and ALL my many accessories finally in a permeant home and well organized…. Swoon! Watch for a post of ALL the fun details coming soon!!! I have a small wall above our stairs is love to accent with! WOW!!! 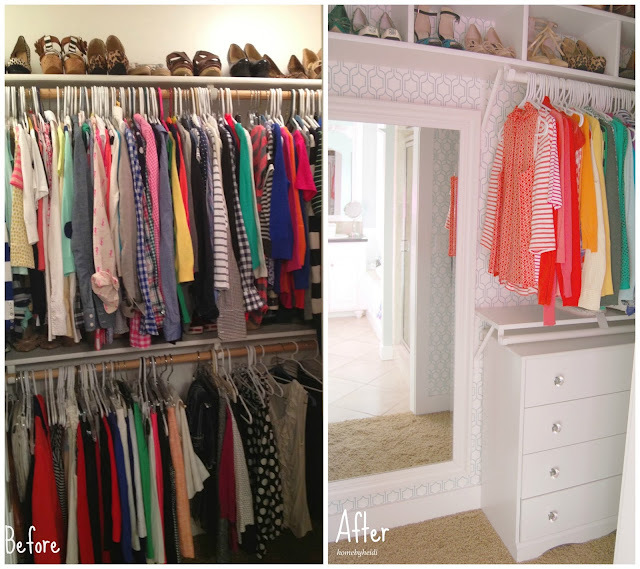 Heidi your closet turned out gorgeous! I used to wallpaper all the time. I'd use it to wallpaper some boards for the back of my bookshelves so I could change them out on a whim. I'm a gfc follower as Tracy Cotton Pickin Cute. Thanks for a chance to win. I also liked your facebook page as Tracy Suzanne. I have been your blog fan for a long time! I have been a Facebook fan for a while now! 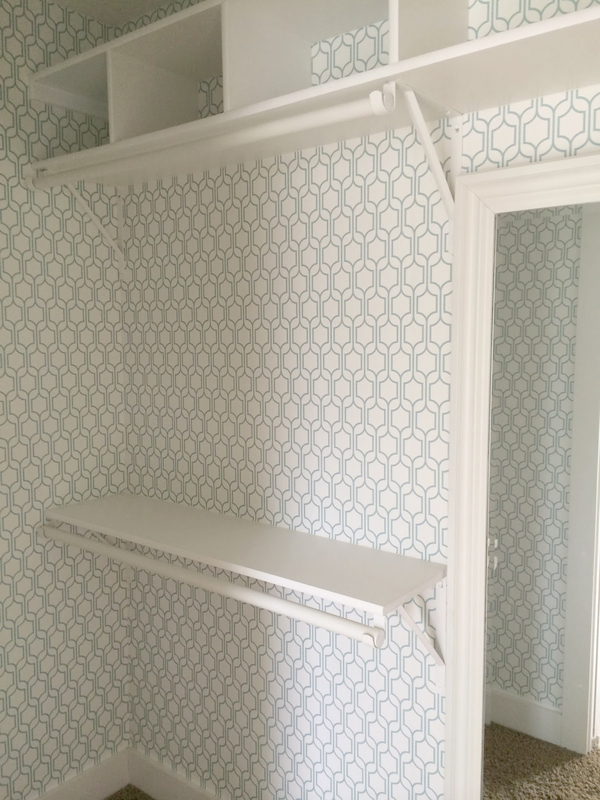 I have a laundry room that is in desperate need of some cute wallpaper... I hope I win! & I will be using the new wallpaper for our son/daughters new closets!!! I'd use the wallpaper in the back of the built-ins I need to redo! It would be so fun! 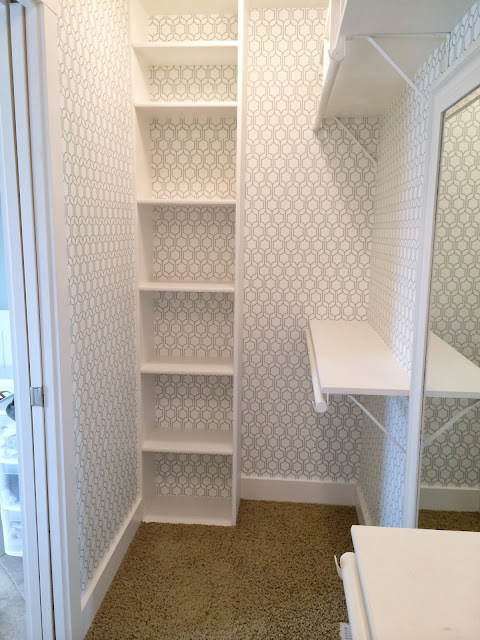 I would like to hang wallpaper in my sons' bedroom or the mud room, which is the most boring room in my house. I would love to do some fun wallpaper in my office! It needs help and it needs to be original. It's a place where I work and I need to be in a bright and inspirational space to keep me happy. I'm a fan of you!! 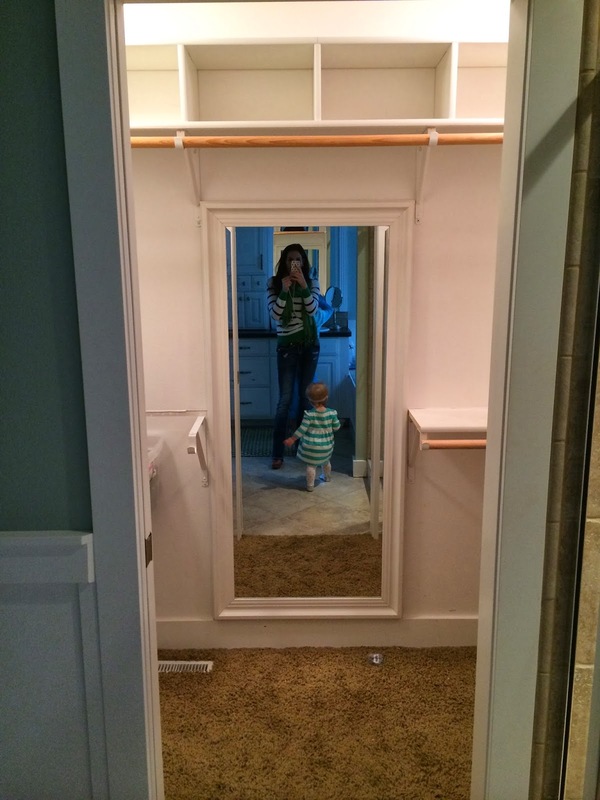 I follow on instagram and I want to re-wallpaper my half bath. 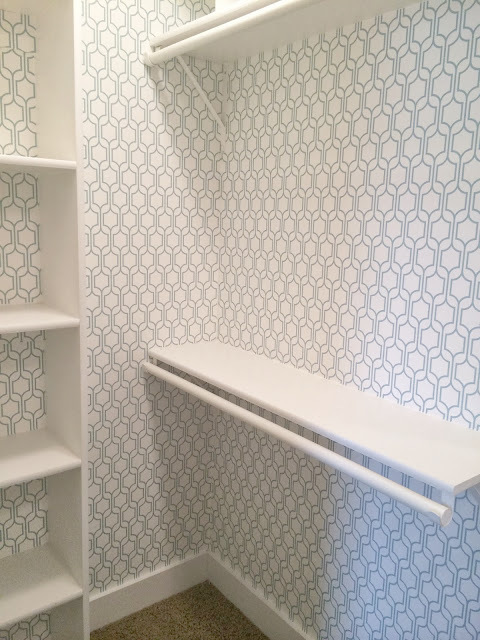 I'm a blog FAN of Home By Heidi I would love wallpaper my bathroom. I found you on Pinterest and I love your work!! I am a fan of your blog. 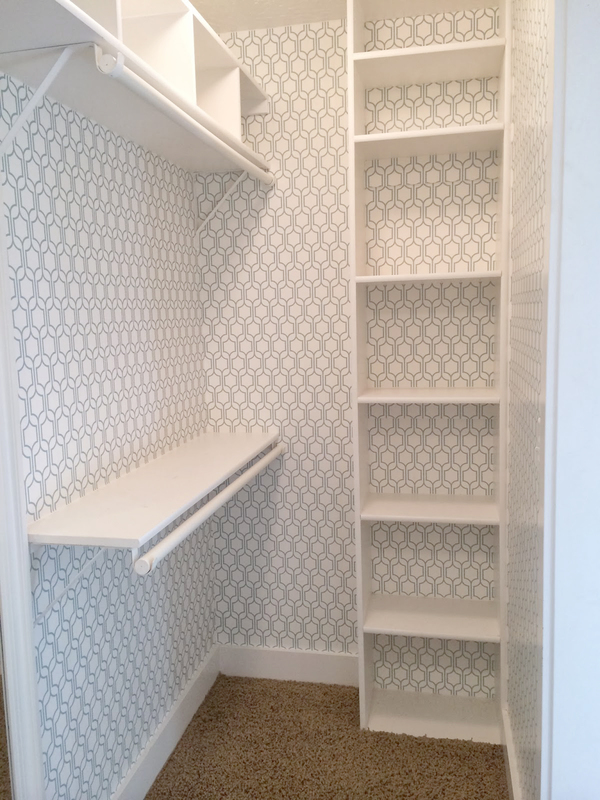 I would love to do some fun wallpaper in my bathroom!! I love your closet now with the beautiful paper. I am a huge blog fan. I liked your FaceBook page & love your paper. Ian already a fan on all 3 places. Love your hone!! I would hang in my laundry room. I'm a Home By Heidi Instagram follower! And of course I follow your blog and want to wallpaper every wall in my house! Haha, but I won't probably just a bathroom or closet. I am a new follower of your blog! 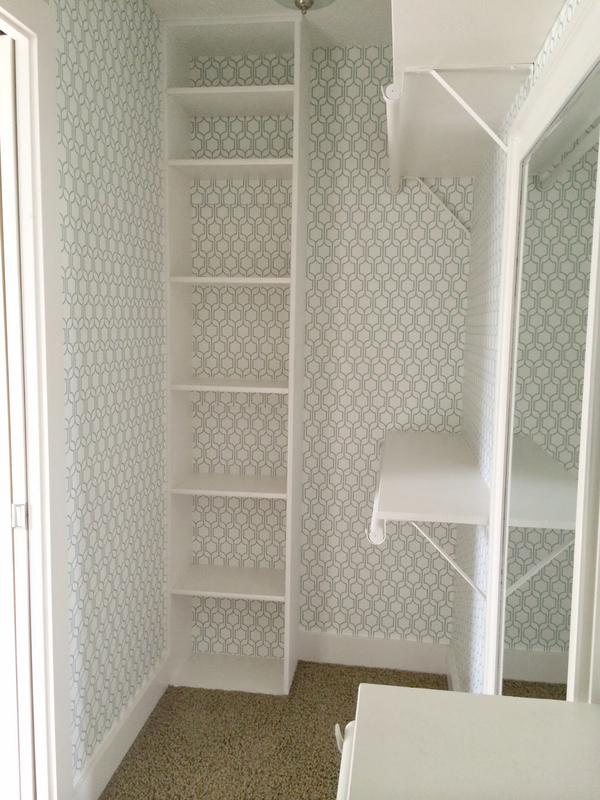 I have been thinking of adding a wallpaper feature wall in my daughter's bedroom. I am loving the Peek A Boo Hot Air Balloon wallpaper! I'm a fb, IG and blog fan! I'd love to win some walll paper! I'm not sure where I'd put it yet but I would find a place! I'm a FB, IG and blog fan! I'd love to win some wall paper! I'm not sure where I'd put it just yet but I would find a place! New follower! Love your stuff. I've been following your blog from the start. ;) love your style and LOVE your closet. I follow you on Instagram as well! 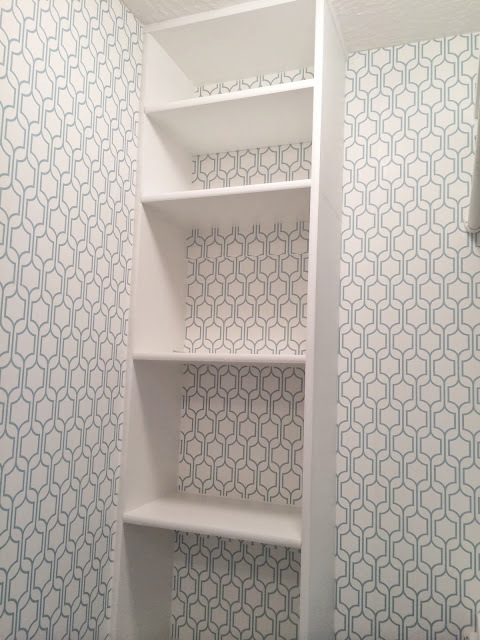 We moved into a new to us home back in October and I'd love to add some fun wal paper to our entry or guest bathroom. Already love you instagram posts! You always have such cute decorating ideas. Following this page too :) My favorite --- The bed making one!! 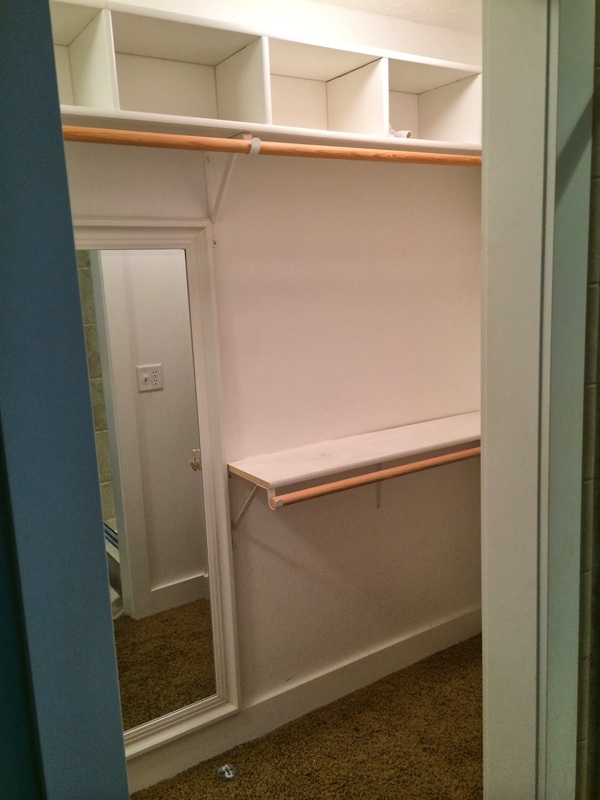 I would love to redo my laundry room!! I shared with some great friends too :) Thanks Heidi! I would LOVE to wallpaper my bedroom! I can't even tell you how much I love this wallpaper! It was so nice to meet you at Snap Conference this weekend! I'm nominating you for the Liebster Award! Check it out here: http://realitytodreams.com/2014/04/the-liebster-award-and-11-blogs-to-watch.html I'm excited to get to know you better. I have been looking forward to this post! Thank you so much. It me so much inspiration to redo my closet as it is very similar to your before closet.